See the official press release from Saleen here. May 12, 2008 - Orange County, California. Steve Saleen and his new company SMS are pleased to introduce the first product in his line of Signature Series ultra-high performance vehicles, the SMS 570 Challenger and SMS 570X Challenger. As a professional racecar driver and innovative businessman, Mr. Saleen is well known as the founder of a number of Steve Saleen brands including Saleen Autosport, Saleen Productions, Saleen Speedlab, Saleen Performance, Saleen, Inc. and now SMS. In the years of building the many brands, Mr. Saleen oversaw and participated in every aspect of the business, in product development, sales and marketing. 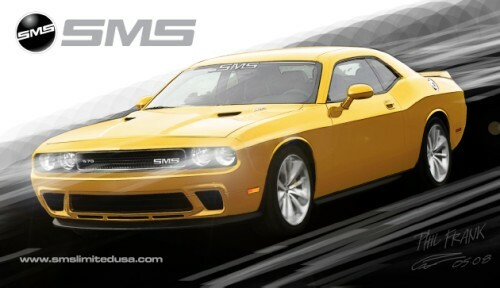 Mr. Saleen's latest endeavor will focus on the expansion into the high-end of the diverse American Muscle Car markets. The fully certified and street legal SMS 570 Challenger and SMS 570X Challenger will be based on the all-new and exciting 2009 Dodge Challenger R/T platform and will feature a SMS Supercharged 5.7L Hemi with respective power ratings from 500 to over 700 horsepower! Both models are fully equipped with a compliment of SMS ultra-high performance components including: drivetrain, suspension, aerodynamics, tires, wheels and interior. "The horsepower and torque that we are developing from the SMS Supercharged Hemi is phenomenal" explains Billy Tally, SMS Chief Technical Officer, "combined with suspension and braking improvements our SMS Challenger will be an incredibly capable, refined and tractable vehicle". Each of these limited edition vehicles will be personally signed by Steve Saleen as part of the SMS Signature Series product line complete with unique badges and graphics. Production numbers will be limited per year depending on the model and the opportunity to be one of the few owners is limited to a first-come, first-served basis, so prospective customers need to act now as production is commencing in the fourth quarter of 2008. "The Dodge Challenger is a great canvas to start with" notes Phil Frank, Chief Creative Officer, "the SMS Challenger will help define our design DNA as we introduce some exciting and functional aesthetic innovations to this already great platform". "I am drawing upon 25 years of rich experience in the automotive industry to address the rapidly expanding global market of automotive lifestyle vehicles, technical performance parts, accessories and apparel" explains Mr. Saleen "SMS is enabling us to do what could not be done at Saleen, Inc. due to the their heritage with the Ford dealer network and Ford vehicles. We are using this freedom, along with our new technology developed at SMS, to create world-class specialty vehicles".